Wait ’til you see how cheesy that punny title is. I kind of couldn’t help myself, though. I don’t usually call anything I’ve produced brilliant, but this time, I almost feel like it’s appropriate. I have officially come up with the BEST. LEGO. STORAGE. EVER. I know, now I’ve built up your expectations, and you are going to be disappointed. Let me course correct. This Lego storage system is adequate. You may or may not like it. My dad recently retired, and since then he has been pawning all sorts of things off on various people as he cleans out 40 some-odd years of work paraphernalia. Since he was a salesman, he had a lot of junk. So he called the other night and asked if we wanted 6 or 7 thin tackle boxes. And no, he didn’t sell fishing supplies, he sold medical supplies. But apparently he carried all kinds of samples in these boxes. 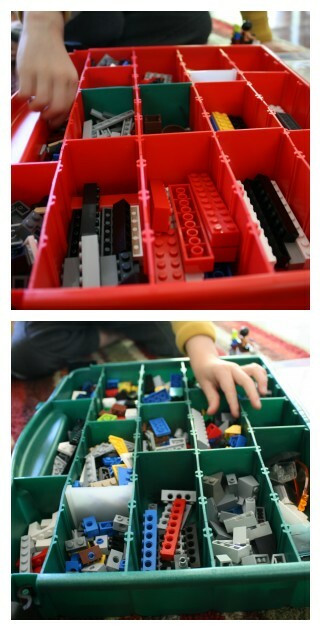 It was his idea that these containers would be perfect for Legos. I was skeptical, but I told him we’d take one and try it out. We did, and I immediately called him back and told him we’d take at least 3 more. It was perfect. See, the number one most frustrating thing about building Legos is that moment when your child comes to you and says, “Mom, I can’t find that flat 2-piece with the clippy thing on the end. I need one of those.” And it has to be dark gray, you know. You spend 10 minutes just figuring out which piece he means, and then the joy you feel at finally realizing what he’s talking about is tempered by the frustration you feel because you, too, cannot find one of those damn pieces. I honestly cannot count the hours of my life I’ve spent looking for one specific Lego. If you play a lot of Legos in your house, you know exactly what I’m talking about. It’s one of the special forms of parental torment that drives me batty. Problem solved with the tackle boxes! (You get my redonk pun now, and you are laughing heartily. Right?) Now, all the Legos are separated by type, and it’s super, extra easy to find the exact piece you are looking for. It’s stunning, the difference between building a Lego project with a massive pile of mixed up Legos or 4 tackle boxes of sorted ones. Because I spent about 2 1/2 days organizing them, I know where every single Lego is, and perhaps not surprisingly, the kids are learning where everything is very quickly. The only downside to this system is the sheer number of types of Legos. I’m one of those people who really wants the system to be perfect, so that when I see a Lego I know exactly, no questions asked, where it goes. 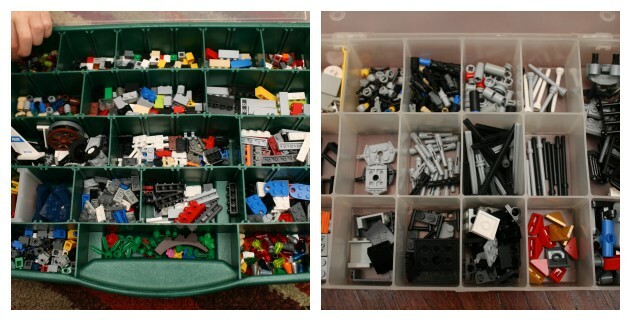 But there are so many minute variations on the Lego form, I would’ve needed 17 tackle boxes to sort them all individually, and some compartments would’ve had only 1 or 2 pieces. So there is an art to it, knowing which parts are similar enough that you can store them in the same compartment, or being able to double up some parts for which you only have a few pieces each. Other than that, though, I really can’t think of a better system. The thing I like about the tackle boxes is that you can adjust the size of the compartments since the dividers are moveable. You could really use any container, though, that has lots of little sections: craft boxes, bead storage, maybe even some kind of toolbox? What do you think? 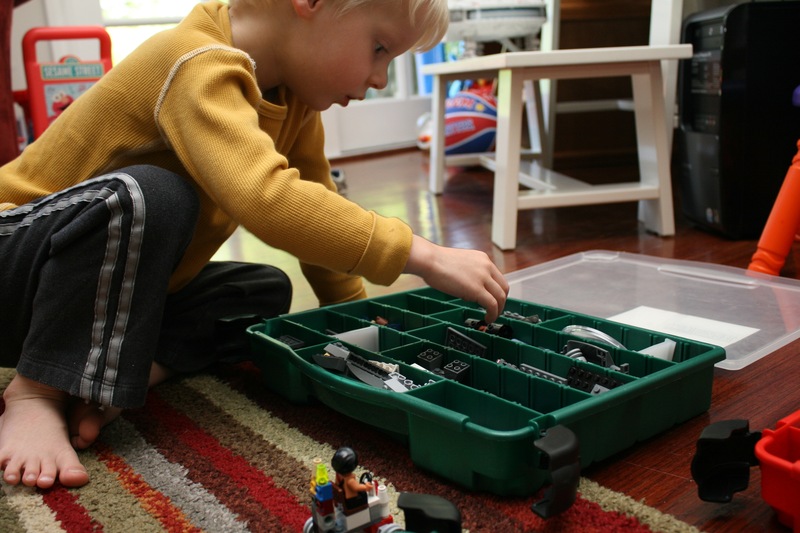 Do you have a good Lego storage system? Everyone loves the new system! Nice! Nate isn’t quite into Legos of that magnitude yet, but I’m totally gonna remember that for when he is. Well done–and oh yes, I laughed heartily at the pun. Heartily. I love this idea. AND I laughed. Awesome. Now, I have a lot of Lego pain in my life. Is this a system that your littlest will help keep up? I could handle the sorting, or def. Matt could, but I wonder about the upkeep. I had a lot of legos stored in a plastic box that slid under the couch. Then I got new couches and it won’t fit anymore. Hence, pain. We had the same system. A huge tub o’ Legos, which still fit but caused the searching-for-one-kind-of-Lego-FOREVER kind of pain. Yeah, the 3 year old seems on board. He needs help putting Legos back into their proper places, but he never put Legos away in the first place. I’m optimistic about the upkeep, but only time will tell. So far, so good! We should have bought stock in Legos. Seriously, Jack has become a Lego whore. What works for us is a plastic rolling drawer cart, which I think I bought at Staples or Target. Each of the six drawers is dedicated to one color (with some overlap, like black and brown). The top is perfect for people, wheels and other odd men out. It’s been a lifesaver! We don’t have Legos here, being as how we have girls so no one ever thinks they might like them as gifts and we just haven’t gone out and bought them the initial gateway dose yet ourselves. But I’m forwarding this pronto to my friend whose son could probably be described as another “Lego whore”! By the way doesn’t it hurt when you tread on one of those little pieces of lego!!! Sorting by colour seems obvious but I think it’s better not. All ours are sorted by shape. It uses the storage compartment sizes more effectively and once the kids have worked out the size, they can easily work out the colour. It was much harder looking through all the black pieces for just the right one, while looking through all 2*3 flat pieces for the black one is easy.